This post brought to you by The Marzetti® Brand. The content and opinions expressed below are that of Gimme Delicious. The easiest and tastiest oven garlic parmesan baked asparagus is made with only 2 ingredients thanks to Marzetti® Veggie Drizzle™ garlic parmesan finishing sauce. It doesn’t get much easier than this folks. This baked asparagus is pretty much the easiest side dish out there. It’s ready in just a few minutes and is very easy to prep. 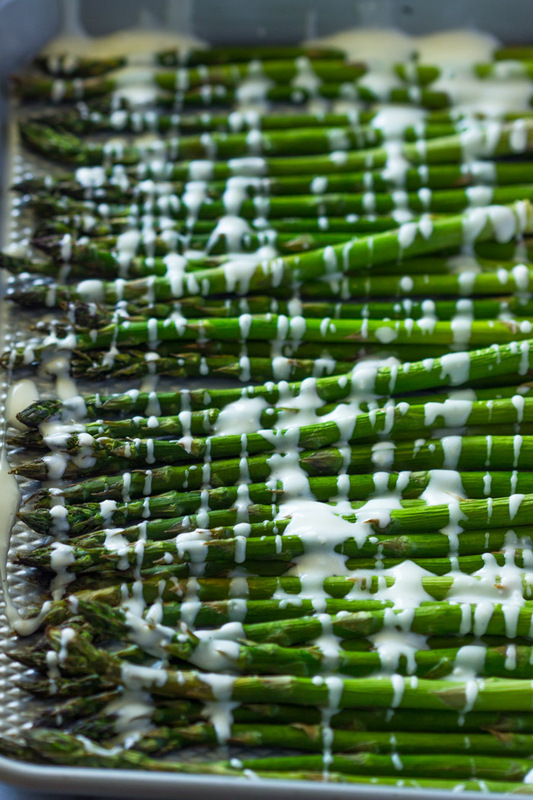 The secret to making this delicious asparagus with just 2 ingredients is all thanks to my new favorite line of veggie drizzle finishing sauces. 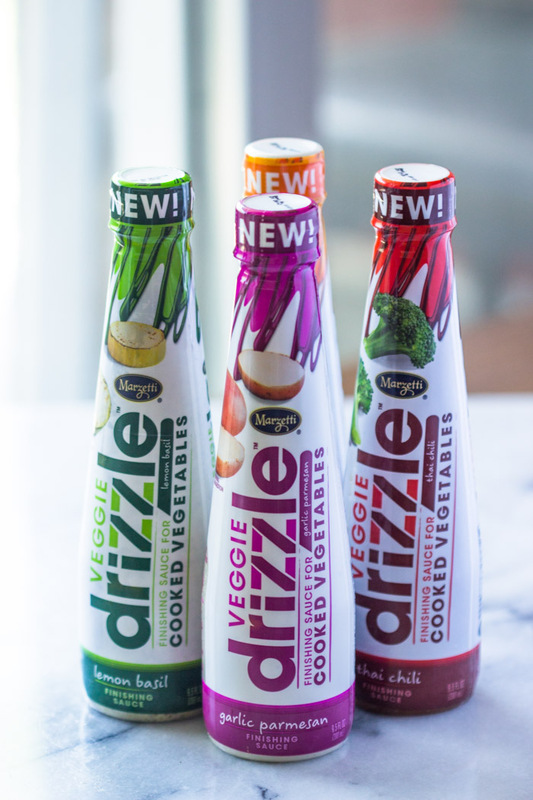 Marzetti® Veggie Drizzle™ finishing sauces are specifically made for use with cooked vegetables. Whether your veggies are steamed, grilled, roasted, or boiled, Marzetti® Veggie Drizzle™ finishing sauces add a splash of flavor that is sure to make any cooked vegetable the star of your meal. Just cook, flavor, and enjoy! 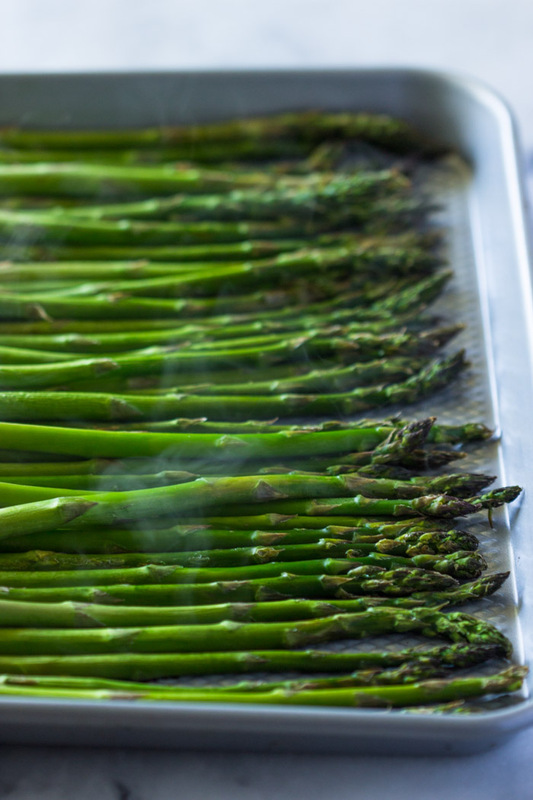 To being, simply break off the tough ends of the asparagus and spread in a single layer on a baking sheet. 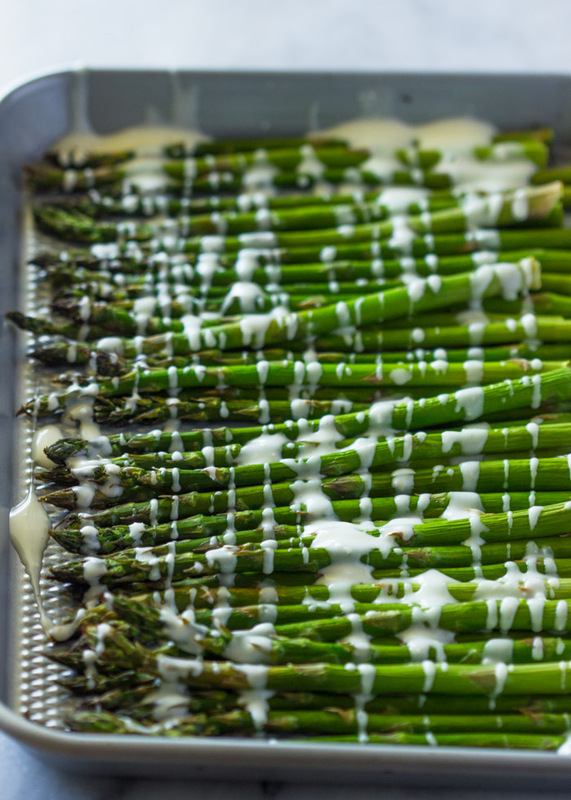 Roast the asparagus for 20 minutes, until tender but still crisp After removing the asparagus from the oven allow to cool for 2 minutes then flavor with zig-zags of Marzetti® Veggie Drizzle™ sauces. I used garlic parmesan because it’s one of my all time favorite flavor combos but feel free to use any of their other flavors. 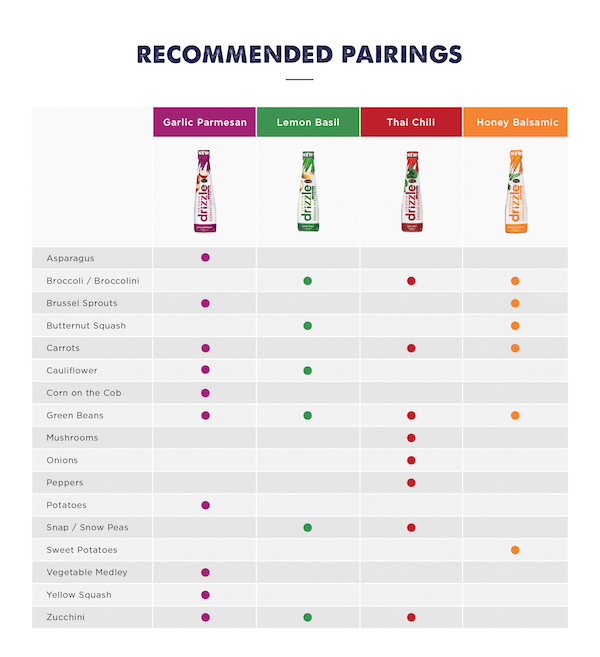 The Veggie Drizzle sauces come in 4 flavors; Garlic Parmesan, Thai Chili, Lemon Basil, and Honey Balsamic. I’ve tried them all and they’re all so damn good so it’s all about your personal preference. Plus, look at these cool bottles! I’m in love with all the colors I just can’t get enough! They shouldn’t be hard to spot in the supermarket, you should be able to find them in the produce section of the grocery store near the refrigerated pre-cut / pre-prepared items. Preheat the oven to 400 degrees F. Grease a sheet pan with olive oil or line with silpat; set aside. 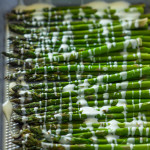 Break off the tough ends of the asparagus and spread in a single layer on baking sheet. 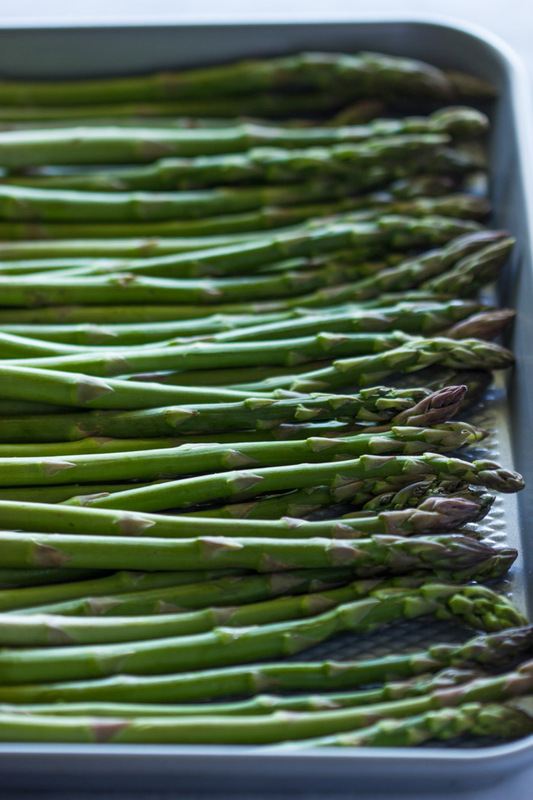 Roast the asparagus for 18-20 minutes, until tender but still crisp. Remove from oven and cool for 2-3 minutes. Next, flavor with a zig-zig of Veggie Drizzle. Enjoy warm as a side.